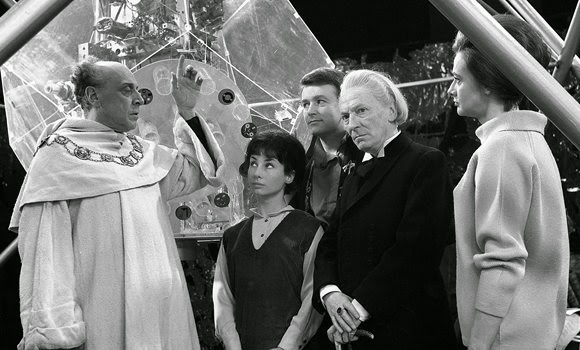 Doctor Who: Looking Back At THE KEYS OF MARINUS | Warped Factor - Words in the Key of Geek. Come with us now as we consider what can probably now be termed the rime of the ancient Marinus, looking back over the search for its keys! BARBARA: Pity you don't have colour television. DOCTOR: Oh, but I have. BARBARA: Where is it, then? DOCTOR: Well, at the moment it's temporarily hors de combat. BARBARA: Oh, look. That's the sea, isn't it? SUSAN: Yes, and sand. Grandfather, I wonder where we are? IAN: One thing's sure. We're not at Southend. SUSAN: Grandfather, can we go and have a look? Can we? DOCTOR: Yes, I don't think, I don't see why not. There's nothing, no danger about. Come on. Let's go and have a look. IAN: Well, I thought when you switched the scanner on, I thought I saw something move up there. Oh, probably just a shadow. DOCTOR: Well, let's go outside and have a look. A little later on comes another first in the seeding of the idea that the old man has had solo adventures well before meeting his human companions! ''Sea of acid. Astonishing. You know, in all my travels I've never come across anything like this before. ''. His sense of wonder will soon evaporate, though. DOCTOR: Yes, yes. I want to know more about this planet. Your technology, you say, reached its peak over two thousand years ago? ARBITAN: Yes, and all our knowledge culminated in the manufacture of this. At the time, it was called the Conscience of Marinus. Marinus, that is the name of our planet. At first, this machine was simply a judge and jury that was never wrong, and unfair. And then we added to it, improved on it, made it more and more sophisticated so that finally it became possible to radiate its power and influence the minds of men throughout the planet. They no longer had to decide what was wrong or right. The machine decided for them. DOCTOR: I see. And in that case it was possible to eliminate evil from the minds of men for all time. ARBITAN: That is exactly what happened. Marinus was unique in the universe. Robbery, fear, hate, violence were unknown among us. Yes, yes, for seven centuries we prospered, and then a man named Yartek found a means of overcoming the power of the machine. He and his followers, the Voords, were able to rob, exploit, kill, cheat. Our people could not resist because violence is alien to them. IAN: But surely by this time this machine had become a great danger to you? If it had fallen into the hands of the Voords, they could have controlled Marinus. Why didn't you destroy it? ARBITAN: We always hoped to find a way of modifying it and making it again irresistible. So instead of destroying it, we removed the five key microcircuits. IAN: What did you do with them? ARBITAN: One of them, I kept. There it is. The other four were taken and put in places of safety all over Marinus. Only I know where they are, and now the time has come when they must be recovered. BARBARA: Well why don't you simply make new keys? ARBITAN: The keys are very simple, but the microcircuits inside are very complicated. A permutation of numbers and signals that would take a thousand years to unravel. And besides, since the keys were hidden, I have worked on this machine and modified it, so that when they're replaced. DOCTOR: When they're replaced it would mean that your machine is irresistible and you can overcome and control the Voords again. IAN: Surely there must be someone you can send for these keys? ARBITAN: Through the years all my friends, all my followers, have gone. They have never returned. Last year I sent my daughter. She has not come back. All I have now to comfort me is the distant echo of her voice, the imagined sound of her footsteps. But now your coming's brought new hope. Oh yes, yes, you must find the keys for me. And so begins a hunt for the dispersed keys, in a story which sees the main cast move to a different setting in almost all of the 6 episodes. The Doctor will find himself in a similar position four selves later as he's tasked by the White Guardian with finding the segments of the Key To Time to prevent the universe finding itself in a very sticky situation - his efforts then span the whole of Season Sixteen. Back in his older looking younger self, the First and/or his companions take in the city of Morphoton, the screaming jungle, an icy wasteland, and the city of Millenius, before returning to Marinus to complete their quest, which very nearly happens until a false key is placed in the Conscience and the machine duly explodes! A good thing, the Doctor reasons, after all man was not meant to be ruled by machines. William Hartnell was awarded a well deserved holiday during episodes 3 and 4, having worked non-stop for six months a two week vacation was just what the Doctor ordered! Come episode 5 he's back and fully refreshed, although you could be forgiven for thinking he delivered a choice 'Billy Fluff' upon return - the phrase "I can't prove at this very moment" is the troubling line, with the Doctor instead saying "I can't improve at this very moment." But listen to the DVD trivia track and all is made clear. For reasons unknown Terry Nation actually wrote this stumble into the script, which William Hartnell delivered perfectly. 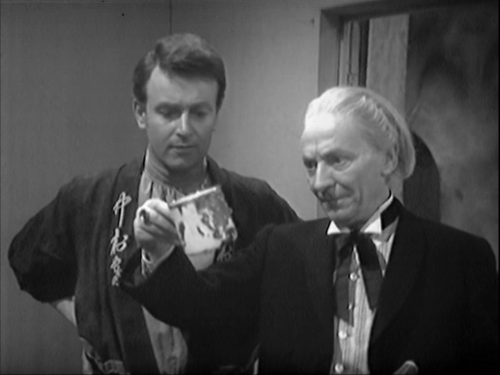 And so it's off to Mexico at the height of the Aztec empire for our fab four, where there's a little romance waiting for the Doctor... and a cup of cocoa to seal the deal!